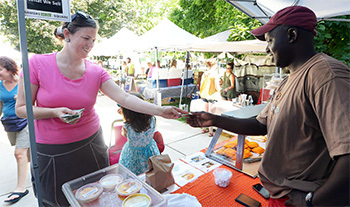 Over the course of the past few years, many farms have seen an immediate pop in sales simply by accepting additional payment methods other than cash. Less people are carrying large amounts of cash and are transitioning to using debit or credit cards for the majority of their daily purchases. With the steadily growing use of card payments, small businesses are beginning to incorporate not only debit and credit cards, but gift cards as well, due to their convenience and flexibility for everybody involved----the buyer, the receiver and the merchant. They are easy to set up and even easier to spend. Gift cards are an extremely useful asset for any business, large or small, due to the simple fact that they help enhance what every business aims for: increase in sales. There are always new and creative methods one can come up with for generating extra revenue, but having gift cards available for your customers does much of that work for you! It is estimated that 72% of customers using gift cards are more likely to spend more than the value of the card. People are typically less hesitant to buy a high-priced item at its full price because it is easy to view a gift card as “free money”, making them feel less bad for spending more of their own money in addition. Gift cards are also flexible because they allow the buyer to choose a designated amount based on their budget. They also allow the person receiving the gift card to choose something of their liking, lessening the inquiry of returns or exchanges. One of the most popular POS systems that small businesses are utilizing now is SQUARE. 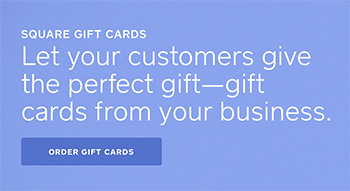 Fortunately, Square now offers personalized gift cards offered in several tiers to work with businesses of any size. As a bonus, these gift cards also work as excellent marketing tools. Look at it as your gift card being essentially the same thing as your business card, except with monetary value, helping to better your business further through brand awareness. An awesome advantage to using Square gift cards is that there is no additional cost other than the physical cards themselves----no redemption fee, no contract, no monthly subscription. They are reasonable in price and very simple to use! Redeeming a gift card is as easy as taking a debit or credit card through SQUARE. Using gift cards, or any cards for that matter should be a simple and easy process for both the customer and the merchant. As our experience shows, the more options you give your present and future customers to pay for your alpaca products, the more you increase the total number of transactions and overall sales revenue. Not currently using SQUARE to process credit and debit payments? Not a problem! 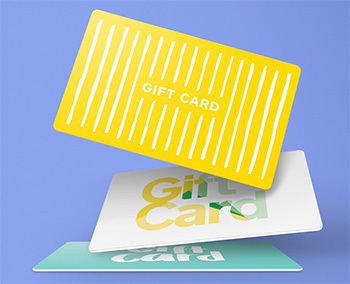 There are a number of other gift card programs that offer very similar features at similar costs----any program you choose will prove to be beneficial in multiple ways, including a spike in sales and brand awareness in your local community at the very least. If you are looking to scope out additional gift card program options aside from Square, check out some of the resources provided below so that you can choose what is best for you and your business for this coming holiday season!